House 120 m² 3 bedrooms, 2 bathrooms in a green setting. 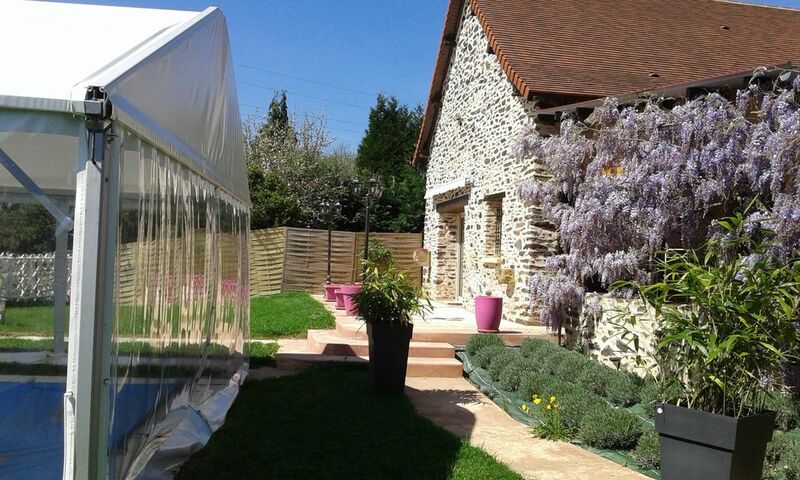 Property situated in a hamlet of the Périgord Vert. Rest and relaxation with family or friends. Fully equipped house. 1 covered terrace with summer kitchen and barbecue + 1 terrace with sitting room. Relaxation with a 30 degree heated indoor swimming pool, covered outdoor jacuzzi and sauna. Boules pitch with ability to play at night. Accepted animals. Easy access for disabled people. Car park. We offer all interior equipment: dishwasher, induction hob, washing machine, dryer, iron, flat screen TV, Hi-Fi, Wi-Fi, baby equipment (cot, high chair, changing table, bathtub, potty). Sheets are included as well as towels. For small equipment we offer coffee maker, microwave, toaster, etc ... We wish to bring you the most comfort possible. Lovely house with great facilities and very hospitable owners. We had a really lovely week in France. The house was very well equipped and spotless. The garden was beautiful with an amazing view. The pool was amazing: the water was kept at 30 degrees as promised and the jacuzzi was also very appreciated - the kids loved it! The owners delivered freshly made bread every morning if written on the board the night before. We explored many places in the region: all within an easy drive. We would love to come to back sometimes and thank-you for a great introduction to the Dordogne! Nous avons été ravis de recevoir Ajanta et sa famille, couple très agréable avec leurs deux enfants. Nous les remercions de leur séjour et nous serons content de les recevoir à nouveau dans l'avenir. Nous étions en famille dans ce magnifique gite très bien agencé et très propre. Le propriétaire ne sait pas ménagé pour nous faire plaisir.Le gite convient pour tout les ages , piscine, sauna,jacuzzi, ballade, repos,terrain de boules. Huis is van alle gemakken voorzien, heerlijk warm zwembad. Verder is alles eigenlijk wel aanwezig. Alles is goed schoongemaakt. Genoten van de jacuzzi. Eigenaren zijn zeer vriendelijk en super behulpzaam. Elke morgen stond vers brood voor ons klaar. Kortom een geweldige ervaring en supervakantie gehad. Heel mooi en schoon huis. Vriendelijke eigenaars die erg behulpzaam zijn. Huis is schoon en netjes. Van alle gemakken voorzien. Sehr schöner Aufenthalt, in sehr gepflegtem Ferienhaus. Die Vermieter sind sehr angenehm und nett. Nous remercions Markus et sa famille de leur appréciation qui nous a touchée. En retour nous avons apprécié leur séjour et leur discrétion. Merci d'avoir laisser le gite dans un état de propreté appréciable malgré l'option ménage. Nous serons ravis de vous recevoir à nouveau si un jour vous le désirez. Caves visits: Tourtoirac 20 km, 45 km Lascaux, etc. various castles: Hautefort, Jumilhac-le-Grand and museums. 5 minutes you are in the Rouffiac leisure center (swimming, water skiing, pedalo, climbing). The Museum of Pomme in Lanouaille. The museum of the truffle in Sorges. Vélo-rail Corgnac ,. Farm visits.